Vigilon Plus Control Panels are available in 3 sizes managing 2, 4 or 6 loops each accommodating up to 200 devices including advanced fire sensors, interfaces, call points, alarm sounders and visual alarms. The Compact Plus 2 loop panels and Vigilon Plus 4 loop panels are available with integrated 24 hour standby and the 6-loop panel has full 72 hr standby capacity. Advanced networking options allow networking of up to 200 panels in a multi-domain structure with options of copper or optic fibre connections. Vigilon’s back-lit LCD display presents clear indication of Fire or Fault location and the control panel’s innovative 8-line x 40-character display with push-button keypad is simple to use. Fire Plans can be tailored to precisely meet site requirements. Vigilon’s software allows network areas to be sectored to evacuate or alert status or configured with pre-set delays. 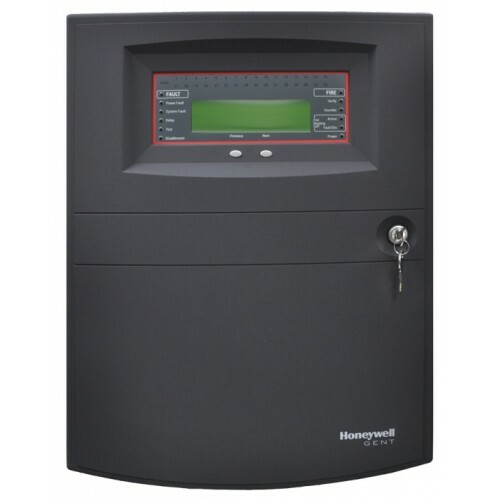 Fully compatible with Honeywell Gent’s innovative S-Quad range – a combined Multi-Sensor range with speech, sounder and EN54-23 Visual Alarm devices in one intelligent unit. The Vigilon Plus Repeat control panel provides full display and control of the system. Connecting to the detection loop, the repeat panel provides a cost-effective solution with minimum requirements for cabling and installation. 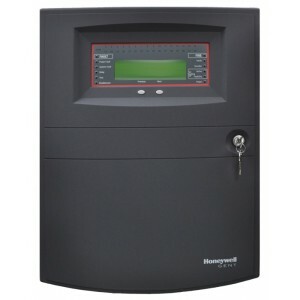 Repeat panels are supplied complete with their own 72-hour power supply and standby batteries.